This is a shift from the government’s earlier plan to order aircraft for VVIP travel and phase out Air India’s 747s currently being used for the travel of the President, Vice-President and the Prime Minister. The matter will be discussed in a meeting of Committee of Secretaries (CoS), headed by the Cabinet secretary, next month. “The government had issues with a twin engine plane and wanted a four-engine plan for VVIP travel. The issue has now been sorted out and they have agreed for a two-engine plane to replace the Boeing 747s. Boeing 777s fit the bill and has been agreed upon and a decision is likely to come in the CoS meeting next month,” said a civil aviation ministry official. Compared to Boeing 747s, Boeing 777s are smaller in size and the aircraft for VVIP travel will have a capacity of around 200 passengers plus a cabin for the traveling dignitary. They will be much more economical than the old Boeing 747s. “Air India has meet all departments concerned on the design these aircraft will have. Once the permission comes, Boeing will be asked to design these 777s accordingly and these can be pressed into service,” said the official. All VVIP flights are run on no profit no loss basis and the government pays Air India for these flights. In 2011, the paid Rs 532 crore to Air India for operating VVIP flights. Sources said the new aircraft would be specially configured by Boeing, and is likely to be equipped with an intensive care unit for medical emergencies. It would have around 30 business class and 150 economy class seats, besides a lounge and state-of-the-art cabin for VVIPs on-board. And what about the requirement that the VVVIPs need 4 and not just 2? Well I guess now we can also dump the B744s as the B77Ws are acceptable to the Gandhi clan. Our Mantris an Netas should stick the IAF BBJs for overseas travel. They need not take their chachas and chelas everywhere with them. We should have a petition filed in the Courts asking government the need to use VVIP aircraft for PM or CM or any such public servant. Why indeed ? What prevents them from traveling in regular flights ? Damn protocol. It should be given to people who deserve it. Not to a bunch of cowards who shut down metro stations in Delhi fearing public demonstrations against the lack of law and order in the country. The security of our nations elected public servants is not above those of common citizens. Its time we stop using words like "leaders" "officials" in the Indian context atleast. They are nothing but public servants of varying accountability. both PM and Prez are never out of country at the same time, and nobody cares for Vice Prez. So, essentially one plane is needed. also, what about IAF's BBJs. Weren't they meant for VVIP travels, and have considerable range. I think they with it to Europe and Japan non-stop. And it certainly won't hurt our leaders if they stop in Europe for refuelling on way to NA. And those helicopters coming. How often do these leaders go to places so remote where BBJ cannot land. Agree with you there - they need (at most) two - i.e. one as backup. This is the current arrangement, where two 744s are taken out of scheduled service and retrofitted with the special interior. Vice-President mostly does short hops to Central Asia or ASEAN/SAARC countries and has the IAF ERJ or BBJ. In my opinion they should've taken two of the AI-owned A310s a while back. If it's good enough for Canada and Spain, it's good enough for us. Range would never have been an issue - even with the 747s, AI have always halted in Frankfurt for VVIP flights to the Americas. Honestly, all this excess is to accommodate media and assorted hangers-on, who should really be paying for their own bloody tickets since all they do once there is report verbatim the various formal banalities that constitute whatever State visit or summit they're there for. But that lot won't give up their free junkets without a fight. In my opinion they should've taken two of the AI-owned A310s a while back. If it's good enough for Canada and Spain, it's good enough for us. Heh, you think the honourable sons of the soil would want to travel in something that can hardly be regarded as little more than a flying piece of metal that spent its two decades of life transporting impoverished labour tripe to and from from the Gulf, and South East Asia? Let them convert two of the AI 744s excusively for VIP use. There's no point using them for Hajj Charters and Dammam flights. Besides, they are paid for so no harm in using them. I think the CMs do travel in regular flights - First Class - paid for by your money! ...won't give up their free junkets without a fight. I doubt they are even allowed to use the planes for themselves (of course that doesn't mean it's not possible!). I'm not fan of any of the Gandhis, but I find the likelihood of an AI jet being kept on standby and then being deployed solely for either of them and their entourages very low. On paper at least, it's AI and IAF aircraft for the President, Prime Minister and a bunch of senior ministers, with governors and state officials using IAF or the state's aircraft. On the other hand, I wish the senior politicians were forced to use helicopters instead of cars between the airport and wherever they're going. four years free of jetya punti! India is looking at the Boeing 777-300 extended range (ER) as a replacement to the ageing Jumbo Jets used as VVIP aircraft for flying our president and prime minister on long overseas tours. Air India has five B747s in its fleets that are maintained mainly for such VVIP flights. But with these aircraft almost 25 years old, a replacement has to be found very soon. "The B-777 300 ER is being considered as the next VVIP aircraft. AI has been operating these aircraft for years and has the technical and engineering knowhow for their maintenance. It also has the best pilots for the planes in India," said a source. The Maharaja extensively uses the B 777-300 ER for long haul flights, including the nonstops to North America. Choosing this aircraft would mean that AI can use this for commercial flights when the same are not required for VVIP visits and make it an 'earning' member of the AI fleet. "There is also a practice that when a VVIP flight goes from Delhi, another aircraft is kept on standby here in case AI One develops a snag. When AI One lands abroad, say for instance in US, another nearest AI aircraft, in this case at New York where it has gone for a commercial flight, is kept as standby for the VVIP plane. Having a 777-300 ER as the next AI One would mean this practice can continue without any break," said a source. Security and safety considerations, including in US, have so far favored four-engined jets like B-747 over twin engined ones. The B-777 is a twin-engine jet. "In case of an engine failure, both twin and four-engine planes can land safely at the nearest airport. So technically speaking, safety considerations of modern day jets are the same for both these planes," said a source. In fact, the overwhelming majority of commercial jets being used globally are twin-engine. Four engine options are mainly restricted to three commercial planes — Airbus A 380 and 340 and B-747. Both Boeing and Airbus are struggling to find buyers — read commercial airlines — for these planes as twin engine aircraft are ruling the skies now. Once phased out as the VVIP aircraft, AI will remove the B-747s from its fleet. And then no Indian carrier or IAF would have any four-engine commercial airliner. The Defence Acquisition Council (DAC), which met in New Delhi, also cleared the proposal to convert two Boeing 777-300 ER for VVIP travel, defence sources said. So how many more hoops left before the deal is finalised? And only two? Those 744s are probably pretty low cycle in the grand scheme of things, and have mostly been in dry dock for the past few years. And in the meantime, the three 77Ls which would have been perfectly suited to VVIP travel will be sold at a pittance to EY. In a bid to avoid spending millions on mint fresh planes, the Modi government has decided to take two Boeing 777s which are already flying with Air India. "Two of the youngest B-777 300 extended range (ER) aircraft from this fleet will be transferred to the defence ministry by October 1. These two planes joined our fleet in 2010 and have been flying with us almost five years. The defence authorities along with Boeing will retrofit these planes as India's very own Air Force One," said a senior official. The NDA's decision to go in for AI's used planes as the next Air Force One — VVIP flights operated by Indian Air Force using AI pilots of B-777 will no longer be AI One — comes even as the government had the option to go in for brand new B-777s for VVIP use. Air India is to receive ₹1,200 crore in October this year from the Ministry of Defence (MoD) for the transfer of two Boeing 777-300 Extended Range aircraft for VVIP operations. These funds will be used to retire outstanding loans for these aircraft. Incidentally, the outstanding loans are to the tune of about ₹1,200 crore. A senior Air India official confirmed to Business Line that the two aircraft will be transferred to the MoD on October 1, and that the funds should flow into Air India’s coffers almost immediately after the transfer takes place. VVIP aircraft are primarily used by the President, Vice-President and Prime Minister on their trips out of Delhi, be it within India or while travelling abroad. While the aircraft will be transferred to the VVIP squadron in October, it will take some more time before they can be used. This is because the aircraft will have to refitted to meet VVIP requirements, officials said. Will they retain AI livery? why didnt they opt for the 77L? why didnt they opt for the 77L? AI intends to sell them, and still may, to EY. Are you sure of that, 747-237? I thought they may at best lease them out, and still have the same number as they originally wanted, for one ULH route, which in 2007/8 was BLR-SFO, on the radar, before the economy and aviation changed completely. The colours: while the B77Ws look awesome in the Flying Swan livery, I do believe that they will look awesome in the plain Comm Sqdn colours as well, with the IAF colours, the roundels, and the blue among the white and grey! The 77L is too small for the numerous members of extended families and other freeloaders who accompany our leaders on their foreign jaunts. I doubt even the 77W will be sufficient. They should get those couple of A380s that Airbus has stored up in TLS. Modi to get an Air Force One; will it be Boeing or Airbus? Move over Air India. Prime Minister Narendra Modi is bracing for a US-style Air Force One aircraft. The government has begun the hunt for the new aircraft that will fly the Prime Minister across the globe, sources told Bloomberg TV India. This time around, the VVIP aircraft that will the President of India and the Prime Minister might be piloted by an Air Force pilot. Sources said the PMO is working out the modalities with the Civil Aviation Ministry and the DGCA on the flying hours for pilots flying the VVIP aircraft. Further, the aircraft will be fitted with the new SESF (segmented, extended, slotted flaps) technology which will help easy and safe landing on shorter runways. Though it is not clear as to whether the aircraft will be a Boeing, Airbus or a third manufacturer of such special aircrafts. The PMO has asked the DGCA for recommendations on the registry of the aircraft, on the flying hours of Air Force pilots who intend to fly the aircraft among others, said these sources. The PMO, in a letter to the Aviation Ministry, has asked the DGCA whether it will be mandatory to register the new aircraft as 'Military'. At present, Air India flies India's VVIPs. Air India’s 25-year old Boeing aircrafts were being replaced by B777-300 ER, as per Air India's recommendation. The pilots of Boeing 747 flying Prime Minister Narendra Modi and other top dignitaries on long-haul trips are going to receive better training in coming months. Air India is upgrading the flight simulator used to train pilots of the Boeing 747 jumbo which ferries VVIPs by next month. The simulator's visual training module is being upgraded using the latest technology from American avionics major Rockwell Collins. "Our B-747 pilots are going to be the best trained in the world, at par with the training given to Air Force One pilots," said an AI official. Indian dignitaries use the almost 25 year old jumbo jets for their long-haul flights and these planes will be phased out in the next three years — just at the fag end of Modi's term. AI has 15 B-777s in its fleet. "Two of the youngest B-777 300 Extended Range (ER) aircraft from this fleet will be transferred to the defence ministry by the end of this year. These two planes joined our fleet in 2010 and have been flying with us almost five years. The defence authorities along with Boeing will retrofit these planes as India's very own Air Force One," said a senior official. Defence authorities will give the written down value of these planes, estimated to be $100-105 million each, to AI, which will in turn use the money to pay off the aircraft loan for these two aircraft. These two planes will then be sent to Boeing in US for VVIP Retrofitting and high-end security fixtures like anti-missile systems. "However, it will take at least two to three years for these two B-777 ERs to succeed the B-747s being used currently as VVIP aircraft. The Boeing 747-8 being prepared as the next Air Force One for the US President will also be ready only by 2019-20," said an AI official. The old Boeing 747s being used today for long international flights by the PM are safe to fly but are fuel guzzlers. Also, they can't fly nonstop to distant places like the Americas. During the 10-year-long Manmohan Singh's prime ministerial period, the one-stop flight to distant destinations worked well as the then PM was more comfortable with a break on a long journeys. AI is going to get three more B-777 300 ERs from Boeing by 2018. "We are discussing the layout of passenger accommodation of these aircraft with Boeing. We will shortly be making the initial payment of these planes so that Boeing can start work on them. We expect to get them in over two years," said the official. These three B-777s are among the 50 wide body aircraft AI ordered in 2006 as part of the 11-plane order with erstwhile Indian Airlines. Apart from these three, AI is also yet to get six Dreamliners as 21 of the 27 ordered B-787s have joined its fleet so far. The President, Vice-President and Prime Minister will now have to wait longer for their new long range VIP aircraft over confusion on who will operate them - Air India or Indian Air Force (IAF). They currently use four Boeing 747 jumbo jets of AI that are over 26 year old. The government had decided to take two Boeing 777-300 extended range from AI and send them to Boeing in US for VIP retrofitting and high-end security fixtures like anti-missile systems. It was decided that post-modification, these planes will be handed over to IAF which would operate them with technical support of AI. "There has now been a rethink in the government that since AI has the pilots, engineering and expertise, these aircraft should remain with AI. However, there is no clarity over whether these planes can have the registration of a civil aircraft and be used as passenger jets for commercial use of AI when not being deployed for VIP flights," said a source. The rethink in the government also means that India will not get its version of the Air Force One (as the VIP aircraft would have been called had it been operated by IAF) and continue with the call sign AI One. The old Boeing 747s being used todayare perfectly safe to fly but due to their advanced age, they are fuel guzzlers. Air India will continue to fly Prime Minister Narendra Modi instead of the Indian Air Force (IAF) as the two brand new Boeing 777s being procured for VVIP flying will remain with the national carrier. It was earlier decided that the new Boeing 777-300s, to be tailor-made for VVIP flying, would be operated by the Indian Air Force (IAF) instead of Air India just like "Air Force One" carrying the US President. Under the new plan, the new aircraft will remain with Air India but the IAF personnel will only manage the self-protection suite accompanying the aircraft. The Defence Acquisition Council (DAC), which is meeting on Saturday, will also discuss this new arrangement. The proposal is one of many items on the agenda of DAC. Officials said even the new jets being procured for VVIP flying can be utilised in the Air India fleet. The national carrier already flies Boeing 777s. does that mean we will get to fly in the same birds?? does that mean we will get to fly in the same birds? I think yes, just as the situation is now. Before a VVIP flight, it will be reconfigured and santised, and the sophistication put in. And after it, will be reconfigured again, to the ordinary AI specifications. AI will maintain the aircraft, just as AI is doing now. If this 'sophistication' includes a full military communication suite and other toys like missile jammers and the like, then it is better that such classified technology remains with the IAF . I think that the VIP airlift must be entirely a function of the IAF and not AI. Not that the IAF haven't been hacked into, but they still are a safer bet than AI. Sir, the basic airframe maintenance, and its re-usability for AI's day-to-day activities, is better left with AI. When on VIP duty, the plane is taken over by the IAF, and the sophistication put in completely. After the VIP duty, it is again put into a clean configuration, and returned to AI. AI only works on the basic plan maintenance in the meanwhile, under the watchful eyes of the IAF. I think this is fair enough. The NDA Government has approved a proposal for creation of a dedicated VVIP air transport for the President and the Prime Minister on the lines of the US Air Force One that is used exclusively for the travel of the American President. Named Air Force One, it will comprise two Boeing 777 Extended Range aircraft for the exclusive international travel of the President and the Prime Minister. Defence Minister Manohar Parrikar accorded in-principle approval for raising the Indian version of the American Air Force One, at the meeting of the Defence Acquisition Council on Saturday, top Government sources said quoting the minutes of the meeting. Earlier, the call sign of the Boeing 747 aircraft used for ferrying the President and the Prime Minister was Air India One. However, from now on, it will be known as Air Force One. The acquisition of the two special aircraft is estimated to cost about Rs1,400-crore, for which the tendering process is expected to begin soon. The project will later on have to be vetted by the Cabinet Committee on Security as it entails an expenditure of over Rs1,000-crore. The defence and security equipment of the two aircraft, including the electronic warfare suites and jammers, will be maintained by the Indian Air Force. Apart from these features, the planes will also have emergency evacuation suites, advanced anti-missile shield and encrypted satellite communication systems besides conference rooms and restrooms. Incidentally, the Air Force One of the US, is maintained, serviced and operated by the US Air Force. The two aircraft will be serviced and operated by Air India, which will exploit them commercially when they are not being used by the VVIPs. The idea of economic exploitation of the special aircraft is to derive maximum benefit from the investments made in them. The Boeing 777 Extended Range is the world’s largest wide-body twin-engine jet with a seating capacity of 314 to 451 passengers, with a range of 5,235 to 9,500 nautical miles (9,695 to 17,594 km). It has computer-mediated controls and can cover more than half the globe at a stretch. The aircraft, with extended range, modern communication systems, security features and amenities are being seen as a welcome move by the security and Intelligence agencies as Narendra Modi is one of the most widely-travelled Prime Ministers of India till now, constantly crisscrossing the globe to raise the profile of the country by sealing strategic and economic pacts with foreign Governments. I was curious - does this mean AI can use the flight number AI 1 for one of its own flights? Perhaps the BOM-EWR-BOM or something? They have been smoking some good stuff at The Daily Pioneer. Air Force One has been, and will always be, the exclusive call sign of the plane carrying the US president. In think India will have to settle for something else. The requirement should be two with in built defense mechanism on board , better than reconverting a pax B777 when ever needed for VVIP duties. Interesting article, to put things in perspective. In his nearly three-year tenure as the Prime Minister, Narendra Modi has been on foreign trips 27 times and has visited 44 countries so far. From his first trip to Bhutan on June 15, 2014, to his last foreign trip till date to Japan on November 10, 2016, the expenses incurred on chartered flights amounts to Rs 274,88,64,465, according to the data available on pmindia.gov.in. The costliest travel was a nine-day trip to France, Germany and Canada amounting to Rs 31,25,78,000 in April 2015 and the cheapest one was to Bhutan with expense incurred on chartered flight worth Rs 2,45,27,465, the data revealed. There are certain destination where Indian Air Force BBJ aircraft was used and the expense is not mentioned. The expenses on foreign tours of the Prime Minister are met out of the budget head “Cabinet Ministers — Maintenance of PM’s aircraft — Other charges” under Demand No. 47. The expense mentioned is the one incurred on the chartered flight. There are several destinations such as the USA, Japan, Nepal, China where Modi visited at least twice. While the Prime Minister has been travelling on an ageing Boeing 747 so far, Air India One’s aircraft will be upgraded to a state-of-the art Boeing 777-300, the India Today reported. The bill of Modi’s last foreign travel to Japan in November 2016, two days after demonetisation was announced, is still not received. Modi will have a packed schedule of foreign visits from May to July, starting with a trip of Sri Lanka. He is expected to travel to Israel, Russia, Germany, Spain and Kazakhstan, the Hindustan Times reported. As per the information available till June 2013, former prime minister Manmohan Singh’s air travel expense was calculated to be over Rs 642 crore in his nine-year tenure since 2004. The Right to Information revealed that Singh undertook 67 travels since 2004 when he took over as the prime minister, of which bills of five have not been received. The bills received from the rest 62 visits show that Rs 642.45 crore was spent on air travel. The RTI revealed that the maximum expenditure of Rs 26.94 crore was incurred on his seven-day long visit to Mexico and Brazil in 2012 to attend G20 Summit and Rio+20 Summit respectively. India is likely get its new long-haul VVIP aircraft for use of the President, Vice-President and Prime Minister by the second half of 2018 — the final year of Narendra Modi's first term as PM. 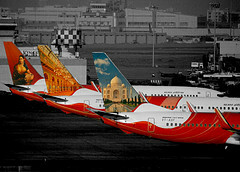 Air India is to get a brand new Boeing 777-300 extended range (ER) each month next January, February and March. The government has decided that two of these three planes will be used as the next VVIP planes, replacing the over 25-year-old jumbo jets India's top dignitaries currently fly for long journeys. Since the two planes will be retrofitted by Boeing with the most modern security and communication systems — on a par with US President's Air Force One — they may be ready only late next year. "The Boeing 747s used currently for long flights by the top VVIPs may be old but they are perfectly safe and comfortable to use. So there was no hurry to replace them. The only thing the jumbos can't do is fly nonstop to North America. They need to do so with a stopover in Europe and being old, are not exactly fuel-savers. The new and fuel efficient B 777-300 ER will be able to fly nonstop on trans-Atlantic/Pacific routes to North America," said a source. AI has five B747s in its fleets that are maintained mainly for such VVIP flights. The airline flies them on nearby international and some domestic routes. The airline will phase its trusted old planes once the replacement comes. I don't understand - I thought they were supposed to hand over the older 77Ws to the IAF? Surely makes more sense to hand over the oldest ones with the most tired interiors - the govt will rip out everything and redo the layout anyway, and govt. planes are sparingly used so the age will not be an issue. Meanwhile, AI can use the brand new ones for commercial ops. Also, will these planes be delivered with commercial interiors/layout or the VIP one? The youngest two AI 77Ws were to be used (scroll up for the story). Perhaps the megalomaniac finds "used" aircraft unacceptable. The Indian Air Force (IAF) might own and operate the aircraft used by the President and the prime minister (PM) in long-distance travel after the privatisation of Air India, a top government official said on Wednesday. "We have to see what needs to be done, whether new planes need to be bought. The air force will take over these duties," the official said. There is a possibility that these will not only be operated by the IAF but also owned by it. Such a decision will involve multiple departments, including the Prime Minister’s Office, and the civil aviation and defence ministries. I'm no fan of Indira Gandhi, but when she was PM, she didn't flap around the globe in a brand new 747. She flew a Boeing 707 that AI kept ready for her foreign visits. That the GOI is busy buying brand new aircraft for the PM today while AI can't even maintain the interiors of its international fleet for its paying passengers is a travesty. Maybe it's just a case of "this is how we are only."